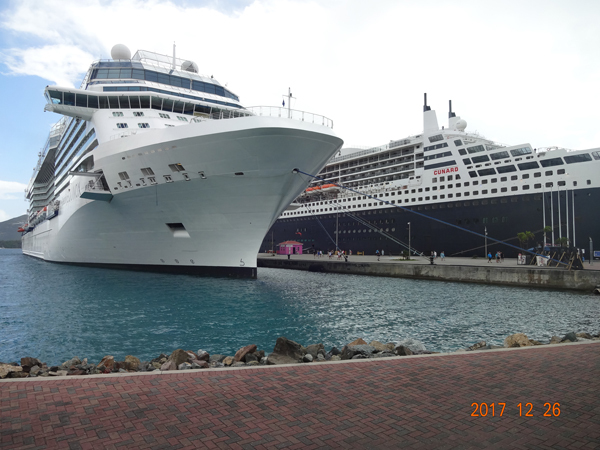 We docked in St. Thomas even though I was led to believe that the Virgin Islands had not recovered and that we dropped one number in ports. I was wrong. The Queen Mary 2 was the first ship to dock in St. Thomas—along with the Celebrity Equinox—since the hurricane. There was still damage evident from the hurricane. There were trees that had large branches missing, but it was most evident near the port itself. A sign of welcome was faded and had been knocked over. I photographed the stump of a telephone pole; near which was the destroyed top off of a lamppost with the light cover shattered. Along the street to Charlotte Amalie were newly planted palm trees that (presumably) replaced destroyed ones. I walked into the town from the port, which was about two or three miles. I got a good workout. I sat in one of the parks and watched the chickens and roosters walk around and look for food. Three times it rained on me. I only wanted postcards, so I got stamps at the post office. Turns out that the vendors right outside the port were selling postcards. I got them on the way back to the ship. The Virgin Islands look lovely. Enjoy you stay there! I hope you enjoyed your day at sea. I like the the scenes on the wall panels of the ship. They are very interesting. You are missing bitter cold temps in NYC! Single digits with wind! Below zero temps! I bet you cannot wait to come home to this weather! 🙂 Enjoy your trip!